JD(S) supremo H D Deve Gowda on Monday filed his nomination from Tumkur Parliamentary seat as coalition candidate, thereby putting an end to intense weeklong speculation about his constituency. Tumkur seat has come alive with the sitting MP S P Muddahanumegowda (SPM) filing his papers as an independent. Monday, being the penultimate day of filing of nominations, saw BJP nominee G S Basavaraj submit his nomination. Interestingly, the day also witnessed former Congress MLA from Madhugiri K N Rajanna and ex-Kunigal MLA and JD(S) leader D Nagarajaiah file their nominations. The coalition partners turned the nomination filing programme into a show of strength. Deve Gowda, accompanied by Deputy Chief Minister G Parameshwara and a battalion of Congress and JD(S) leaders, took out a procession from BGS Circle. Workers of both the parties, waving their respective party flags were present in full strength in the procession. Gowda filed the second set of papers after his wife Channamma arrived at the DC's office. After filing of nomination, Gowda said, he chose to contest from Tumkur following the pressure by the Congress and JD(S) cadre in the district. "I am confident that the leaders and workers of both the parties will strive for my victory, he said. Later, addressing a joint press conference, Gowda, a six-time MP, said, "My goal is to weaken the BJP in the country. I will go all out against the saffron party in this election." Not just Tumkur constituency, I will tour the other constituencies in the state, along with the Congress leaders. I will also campaign for the secular parties in a few other states too, he said. "Congress and the JD(S) have joined hands to achieve one-point programme - to keep the communal forces at bay. AICC president Rahul Gandhi and I held a series of meetings during which we worked out a seat-sharing deal. Accordingly, eight parliamentary seats were ceded to the JD(S). Tumkur is one among the seats allotted to the JD(S). Hence, I am contesting from here," Gowda explained. On Hemavathi river water sharing issue, Gowda said, "The BJP cannot defeat me by raking up Hemavathi water issue. People know my contribution in implementing irrigation schemes in the state." G Parameshwara said, "Deve Gowda is not limited to the district or state. He is a national leader. Deve Gowda is a vital cog in secular parties plans to contain the communal forces. Hence, it is the responsibility of the Congress and JD(S) cadre to strive for Gowda's victory." 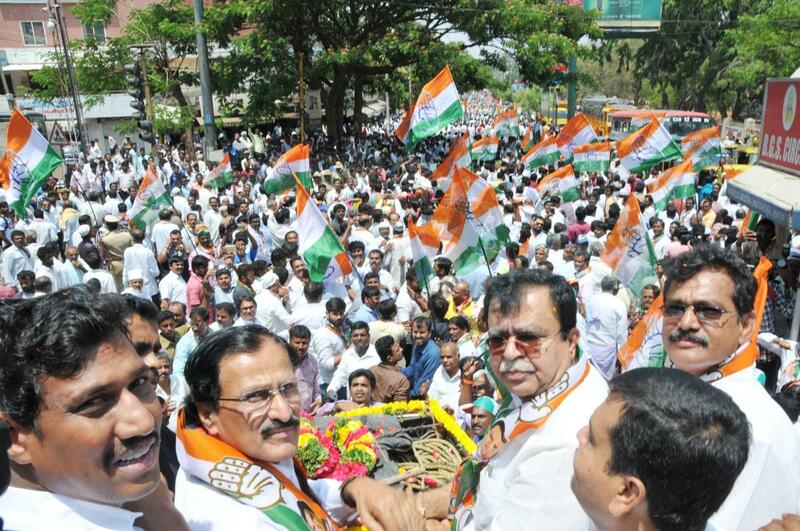 Replying to a query on Muddahanumegowda and K N Rajanna filing their nominations as Congress rebels, Parameshwara said, "MP S P Muddahanumegowda and former Madhugiri MLA Rajanna have filed their papers. I will talk to them and convince them to withdraw their candidature. I am confident that they would respond positively to my plea."